Nothing says "I am a normal human" more than riding in a Fiat, even if you're the Pope. 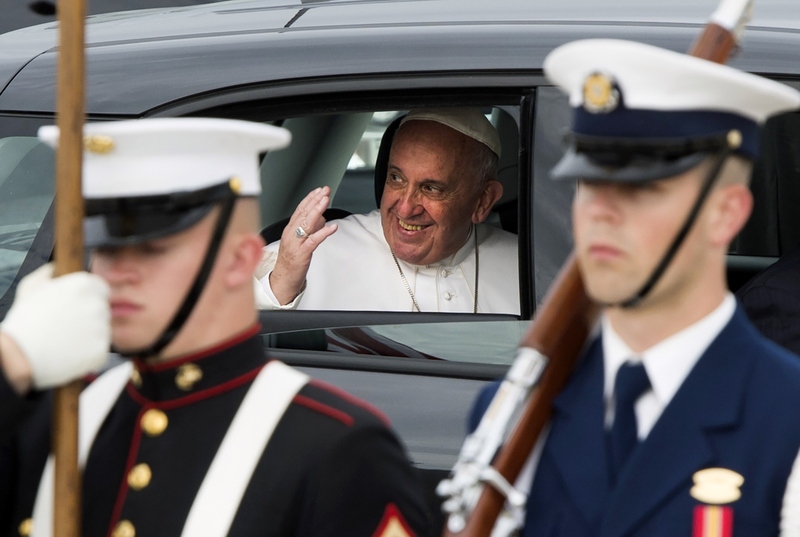 Pope Francis' historic visit to the United States kicked off in his usual, frugal fashion when he hopped into a hatchback, charcoal grey Fiat at Andrews Air Force Base in Washington D.C. The mini Popemobile turned more than a few heads, but it's exactly the symbolic gesture we should have expected from the modest Vatican leader. The Pope is zipping around town in a Fiat 500L, which has way more room for activities than its sister model, the 500. The sedan boasts 4 doors along with extra leg and headroom. The Fiat is stylish, reasonable, and anything but luxurious. That much can't be said for the enormous Suburban security vehicles that are flanking the Pope's Fiat. It does, however, make for some excellent photo ops. The Pope's Fiat license plate, which reads SCV1, is also symbolic. The translation of "Status Civitatis Vaticanae" from Latin, or "Stato della Città del Vaticano" from Italian, means "Vatican City." Though Pope Francis intended to push all pageantry aside, we can't help but gush over every adorable shot of His Holiness riding around in a Fiat. So here's some of the best images of our favorite Popemobile, well, ever. Oh, and if you're wondering how Fiat feels about the Popemobile, it should be no surprise that the company feels pretty #blessed.